I grew up in a household where ultrasound technology or sonography was as likely a dinner-table topic as our individual school day routines. Both my parents work in this field and would often use ultrasound systems for teaching. This past summer, I attended a summer program at Harvard during which I studied neuropsychiatry. When asked to create a capstone presentation on a topic that dealt with the brain, I immediately gravitated toward ultrasound, a subject that has fascinated me since I was a young child. The following commentary is taken from that assignment and exercise. It is largely taken for granted that the primary value of ultrasound technology is its ability to probe inner organs and tissues without the use of an invasive scalpel or surgical instrument. 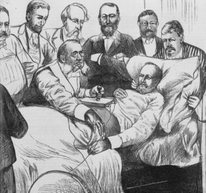 It is hard to believe the advancements we have seen within my parents’ lifetime, and disturbing to discover what passed for medical assessment in the late 1800s and early 1900s. 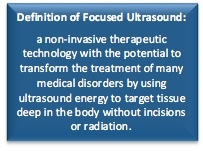 ultrasound technology as an alternative to invasive procedure more promising than in the field of neuroscience specific to the human brain. Rather obviously, it is very difficult organ to access. This makes sense anatomically because it is a very important organ, and one would expect that Nature wished it to be protected. 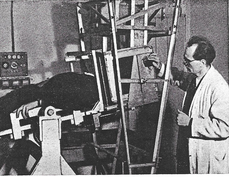 Ironically, while early pioneering research, by Dr. Karl Dussik of Austria in 1942, is based on experiments assessing brain physiology, the medical fields most impacted by sonography over the next 40-50 years (OB/GYN, Abdomen, Breast) were not brain-related. It is only recently this technology has reached trial/approval status in neurobiological fields. One neurological disorder that emerging ultrasound technology offers promise to relieve is Essential Tremor. It is among the most commonly observed tremor disorders, although distinct from Parkinson’s Disease. Several million Americans are estimated to be suffering from this disease. 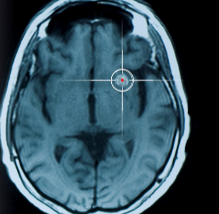 Prior to 2016, when the United States FDA approved a focused ultrasound device for treatment of this condition, patients’ only alternatives were anticonvulsant medications or brain surgery. The surgical options being a permanent removal of brain tissue (thalamotomy) or the implantation of an electronic device to periodically shock the thalamus (deep brain stimulation). Both these options are considered invasive. Specifically, with respect to cranial anatomy, focused ultrasound’s ability to excise tissue without disturbing the integrity of the scalp and skull offers great hope to those cruelly afflicted by convulsive disorders. Previous blog posts have noted that the future promise for ultrasound treatment versus surgical intervention rests on its precision and non-invasive qualities. The potential applications are only beginning to be imagined. In two weeks, I will follow up this discussion with the potentials being studied for the treatment of Alzheimer’s Disease with ultrasound technology. Gina Miele is the daughter of Frank Miele, MSEE , President of Pegasus Lectures, Inc. and Carol Miele, RN, RVT, RDCS, FSVU, Vice President. She attends high school in Dallas, Texas as a Junior at The Hockaday School. *** A Special ‘Thank You‘ to Focused Ultrasound Foundation for use of images, statistical and industry research. This entry was posted in News and Commentary and tagged analysis, commentary, imaging, research, ultrasound. Bookmark the permalink.